The name “25 Rare” comes from the local dialect of Paternopoli indicating the ‘25 steps’ that connect the old part of town with the new. 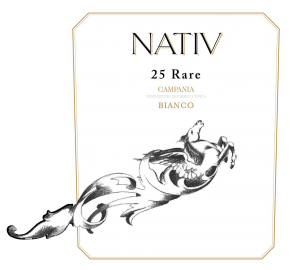 It is an interesting blend of carefully selected Greco and Fiano grapes sourced from estate-owned hillside vineyards. Crisp and smooth with mineral notes and aromas of peach. It is ideally paired with seafood dishes, shellfish, soft fresh cheeses as well as herbed cheeses and white meat dishes. In stainless steel and bottle for a total of 6 months.